Seriously considering this career! Just left being "farmer's wife" for six years at an off-the-grid farm in Arizona. Before that, I did office work, restaurant work, and was a copy editor. I love travel, and when I was little I was always jealous of my brother's Tonka trucks. I think I'd love this job. I really appreciate all the help on this site (studying High Road now!) and looking forward to getting to know you all. I was just at the Arizona DMV this morning and the guy told me to make a shrinked copy of it and laminate it (he said, use clear contact, shelf paper, it's cheaper). Failed my test Wednesday and passed today! Andrea, Jolie and all the other amazing ladies out there - you ROCK!!!! I am so excited for you! Thank you for helping me know I can do it, too! You're my heroes! I am going to postpone school till after the holidays (got some work coming in, make some money so I won't have to sleep in the back of my truck during driving school) ... but will be going to take the permit test tomorrow morning! Wish me luck! Be safe out there, everybody! Thanks guys, I appreciate all the info and encouragement. I know it's going to be great, I was just getting caught up in other people's drama for a minute. I'm so excited about this! Deb, I'm learning so much about my friends and myself in this. Wow - how much fear people have and how they let it control them. Not only in big life decisions, but just spending a lot of energy worrying about things that don't need to be worried about. Crazy. Anyway, thanks everybody! I'm looking at getting my CDL permit next week and starting school 11/3. I'll keep you posted. We don't see each other much anyway ... she's in NC and I'm in AZ. I think all my friends are just, like, what the heck, when I tell them I want to be a trucker, because it's totally out of the blue. I'm overeducated (2 bachelors degrees + a masters in fine arts) and up till six years ago had nice predictable jobs, like waiting tables or office work. When I went to live on a farm my friends & family thought that was adventurous and cool, but now that I want to be a trucker ... honestly I don't know what they really think. Whatever. Fortunately of all people my mother has been the best! I think she's jealous. Oh, and mountain girl? That kingpin thing? Makes me want to get in a truck, like, RIGHT NOW. I have to defend my friend though, she is super cool and you would love her, she just doesn't know, um, beans, about trucking. She says she knows a lot of truckers but they must be local delivery types. So I was talking with a girlfriend about trucking and she tells me I'll probably not like it because it takes a lot of lifting, operating pallet jacks, lift gates, etc. I just left a farm where I handled 50 lb. feed sacks - right at the edge of my strength. I don't mind physical work but if it's too much for me, she might be right that I'd be unhappy. Could you guys & ladies who are already driving please tell me what's the reality? Would I be getting in over my head? I've been so excited about trucking but want to go in with eyes open. I was set up to start school two weeks ago but postponed so I could take time to be sure this is the right way to go. Thanks. 😱 They called! I go Oct 23 @ 9:45 for my CDL A test. You could try packing oregano or powdered cloves around the tooth - they are natural antibiotics and should help. Maybe someone can correct me, but I don't see the urgency of getting endorsements unless the company requires it. Surely we can get them later? Knight doesn't require any, and I have my hands full studying the main stuff. Thanks PJ, it's really good to hear about how these "facts" translate into real life. I'm leaning toward dry van based on a thread of Old School and Daniel (I think it was) ... different ways to run based on the flexibility on delivering loads. Don't think I would enjoy flatbed because of the tarping ... I can wrangle a feed sack but those tarps are heavy. There's intangibles too ... oddly enough although the facts are on Knight's side, my gut is saying Stevens ... but that is probably based just on more or less rapport with the recruiters. And if Stevens is in line for a buyout, I'd rather steer clear, I've been through those, too much drama. 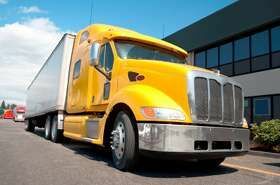 Don't know if this will help in your situation, but when I go on road trips (I'm not a trucker YET!) I make smoothies in advance and freeze them in plastic cups or juice bottles, then keep them in a cooler with lots of ice. They will stay good as long as they don't thaw out too much. SCHOOL: Both are 3 weeks. All info is from recruiters or current company brochures EXCEPT I haven't verified the Stevens 3-yr school repayment deal - that particular info is from this site. For myself, none of these factors is a deal-breaker by itself, but when you add them all up, Knight looks a lot better. Note I haven't talked to any drivers yet. For me, big factors are pay during training (I am dead broke!) and fact that Knight is in AZ ... kind of unique situation I'm in, but where I'll be spending most of my off days is way out in the boonies in AZ, country roads where I don't guess the company would like me to bobtail their rig, so I guess I'll park my 4x4 in the company yard while I'm working. Stevens' closest yard is SLC. I'm amazed by the people on this site. Thank you so much - you haven't made the decision for me, but gave me some great food for thought. Thanks for the information Daniel, Doug, mountain girl, AJ D., PJ. Old School: no problem. Good lessons, and I appreciate that you help keep this site honest. I got interested in trucking originally for the adventure, money, and so I could tell my brother my truck is bigger than his. But now I'm really excited to be part of this world because the people are so cool (at least a lot of them) - people who are generous and care about each other and what's right. Thank you. I'll let you know what I decide. Stay safe. Stevens has me training in Denver, not Dallas - I'm from Arizona. They are telling me to bring $400 to cover $175 for licensing and tests, $90 for housing and the rest to pay for my own food during training. There's supposed to be a kitchen in the lodgings. Knight (Squire) is no longer paying for students' lodging in Phoenix. They have a setup with a local motel at $38 per night. I was liking Knight because they pay $300/week during training, but the lodging cost will cancel that out. I appreciate knowing that. Did you train in Dallas or Denver or where? Awesome - something I hadn't considered. Thanks Daniel. So now I'm signed up with both Stevens and Knight (Squire) to start school in two weeks. I need to make a choice. I totally understand this is all up to me and it will be fine either way, but just wondering if anybody has comments on one or the other to help me choose. I've got the factual info from this site & the recruiters - more looking for whats-it-like-to-work-there comments. Anybody? Matt, congrats on making the decision! I'm not 100% on Stevens yet ... just talked to Knight as well so now I have a choice to make. Hopefully one way or the other I'll start school 10/13. Good luck, let us know how it goes! Thank you. :-) Reading Brett's book really helped clarify the issues with logs & compliance. Looks like Stevens (I'll probably be going with them) has e-logs, so that simplifies things. Congrats on your successful first year!